Writer: This post is written by Jay Cardiello. With the rise of obesity, there has been a significant increase in the demand for weight loss products. Many of these have turned out to be shady products without any legitimate scientific backing. However, this has led to a surge in the demand for natural remedies which have become extremely popular in recent years owing to their lack of side effects and a large scientific community involved in a plethora of research studies. Among these, Cannabidiol (CBD) has quickly become famous due to the numerous health benefits associated with its consumption. In particular, its ability to alleviate insomnia, social anxiety, pain, inflammation, depression, epilepsy, and diabetes has been astounding. This naturally leads us to consider the potential effectiveness of CBD oil for weight loss. 1 Does CBD oil help with weight loss? 1.1 So, how exactly does CBD trigger weight loss? 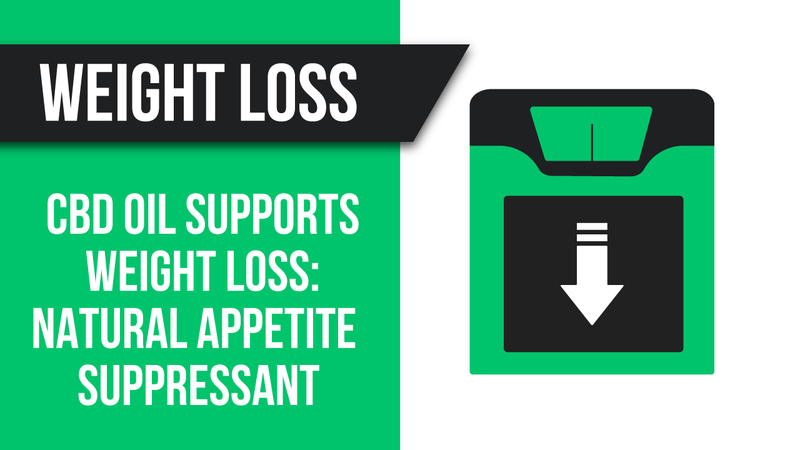 2 What is the appropriate CBD dosage for weight loss? In order to establish a satisfactory answer to this question, we must first understand how cannabinoids affect the human body. One of the most important physiological systems in the human body is known as the Endocannabinoid System (ECS). Modern scientific research in this field has led scientists to believe that ECS is vital in preserving homeostasis, which is just a fancy term used to describe maintaining the human body in balance. Two of the best-known cannabinoid receptors in the human body are CB1 and CB2. CBD directly influences the ECS which, in turn, regulates and mediates many important bodily functions such as mood, sleep, and appetite. Thus, while existing reports indicate that THC increases appetite, the CBD oil appears to help with the regulation of the human body and keeps it well balanced. What that means is the following – CBD will stimulate the appetite of malnourished people such as the cancer patients on chemotherapy, while simultaneously curbing the appetite of people who need to lose weight such as those affected by obesity. So, how exactly does CBD trigger weight loss? The answer to that question is surprisingly simple – CBD relaxes the part of the brain that is responsible for generating the urge to eat. Thus, CBD will substantially reduce overeating under pressure and make you feel less hungry in general. It is a well-known fact that humans tend to eat excessively when extremely stressed. Furthermore, a CBD weight loss study has shown that CBD also affects metabolism through a process named “fat browning”. Fat browning refers to the modification of the white-colored fat tissue into beige-colored fat tissue, whereby white fat tissue stores energy whereas the beige fat tissue expands it. Some doctors insist that CBD is an essential nutrient that helps you relax and lose weight. Akin to vitamins, CBD promotes health and people may experience a negative effect on their immune system when their diet becomes deficient in CBD. They even go as far as claiming that people do not need to stop taking their daily dose of CBD in any real-life situation as it is beneficial for their well-being. However, other doctors warn that while CBD is safe and will not cause any harm whatsoever, more studies are needed in humans before CBD can be used for weight management. They argue that there is no sufficient evidence to show that using CBD will directly cause weight loss in humans. Another CBD weight loss related study in the Molecular and Cellular Biochemistry scientific journal indicates that CBD promotes browning and lipid metabolism. The authors argue that, as such, CBD may be explored as a potentially promising therapeutic agent for the prevention of obesity. In 2012, it has been shown by researchers (published in Psychopharmacology) that CBN may increase feeding whereas CBD reduced the food intake in line with previous findings, supporting the need for further work examining possible anti-obesity effects of CBD. However, a study in Medical Hypotheses proposes a seemingly paradoxical conclusion that a THC/CBD combination drug may actually produce weight loss and may be a useful therapeutic for the treatment of obesity. Of course, the paradox arises from the fact that THC is well known to trigger increased hunger and appetite, but the study’s results are based on the statistical premise that obesity seems to be much less present in cannabis users as compared to non-users. Further clinical trials on humans will be crucial for investigation and clarification of the full range of effects of CBD when it comes to weight loss, but the already existing plethora of positive reviews by consumers is causing a noticeable stir. What is the appropriate CBD dosage for weight loss? The appropriate CBD dosage for weight loss differs from person to person. Human bodies are fascinating in a way that we often respond to external stimuli in unique ways due to the underlying factors including genetics, history of use, general health, weight, ethnicity and so forth. The same goes for CBD consumption. CBD is not intended for use under the age of 18. It should not be consumed during pregnancy. Please do consult your physician before use if you have a medical condition and/or are already using some other medication. Do not exceed the recommended serving size. Start with a small dose of CBD oil and try to find the minimum effective dosage. You can achieve this by starting off with a dose of 5 mg of CBD per day and maintaining it for several days. If the results are not noticeable and there are no changes, increase your CBD intake gradually and maintain for a few days at every new dosage. This process may take up to 30 days before CBD’s effects take place, so please be patient and persistent. As the saying goes, patience is a virtue. My personal experience with CBD for weight loss has been remarkable. I have been able to shed 10 pounds of mostly fat by introducing CBD as a dietary supplement in my daily regime. Even better, I tend to use a very low dose of 10 mg of CBD per day which means that I have achieved amazing results relatively cheaply. For comparison purposes, I used to spend a lot of money on herbal fat burners and other dietary supplements in order to lose weight, but have not been able to produce the same results that I have accomplished with CBD. As a result, I now feel more energetic and I have gained a lot of confidence! Needless to say, I highly recommend CBD oil for weight loss. You can also check the Best CBD Oils in 2019 if you’re interested to get yourself a bottle. Please remember that you should not expect miracles – CBD is a dietary supplement and not a fat loss enhancing steroid that will suddenly give you the physique you see in fitness magazines! Nonetheless, CBD may tremendously speed up the weight loss process while helping you achieve your perfect weight. Reputable sellers and manufacturers will not claim that CBD is a miracle solution to all of your life’s problems, and you should definitely not be binging on fast food if you expect to achieve excellent results. A well-structured and consistent exercise routine will further speed up the weight loss process, as will a healthy well-balanced diet and an active lifestyle. Finally, you should do basic research and look for a legitimate and reputable CBD brand – please stay away from the black market and underground dealers as their products may be of low quality and completely untested! Also, check out the latest CBD oil coupons to order CBD oil to support weight loss.